I’ve mentioned before that my husband will only eat squash if it’s prepared in ways that disguise its sweetness and bring in lots of other flavours. I had lots of squash leftover from my risotto and was determined to find a way to use it that he’d like. I came across this basic idea in Nancy McDermott’s “Real Vegetarian Thai” but I played around with it enough to let you have a recipe, for a change! We both thought that the sauce was fresh and tasty and really brought out the best of the butternut squash. 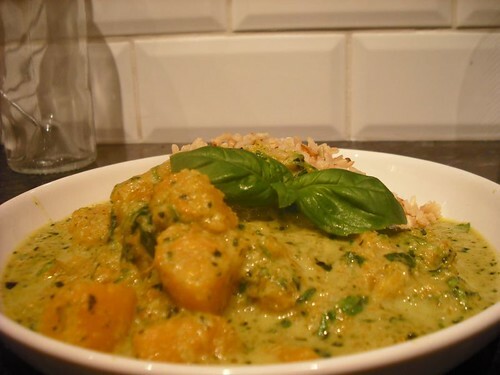 I served it with some brown rice flavoured with a slight touch of star anise and coriander seed. Blend together the shallots, garlic, chillies, lime leaves, half of the coriander and basil with a splash of water unil you have a smooth paste. I use my mini chopper attachment. Heat the coconut milk in a large pan then add the green paste and cook together for a few minutes. Add the water (from the rinsed out tin), the squash, sugar and salt. Increase the heat until boiling then turn down and cook until squash is cooked, about 15 minutes. Stir in the rest of the coriander and serve. This entry was posted in Real Vegetarian Thai and tagged Thai, vegan by efcliz. Bookmark the permalink. Mmmm that looks sooooo good. I hope I’ll find a butternut squash soon. This sounds heavenly and I’d love to make it. I shall add this to my collection of butternut squash recipes. For anyone out there who gardens now is the time to sow butternut squash seeds. Grow as many as you have space for as they keep really well and become sweeter as winter progresses. Mmm. Butternut squash is the best. My husband can’t stand the texture, but I love how sweet it is. I’ll have to make this when he goes out of town..